Originally published in the East Bay Express on Feb. 17, 2016. In Chochenyo, one of eight languages spoken by the Ohlone people in the East Bay, there is no word for goodbye. Instead, one might say “utaspu meene,” which roughly translates to, “Take care of yourself.” To say goodbye would imply a final parting, rather than a brief separation, explained Vincent Medina, who first began reviving the language in 2010 after it had been dormant for more than seventy years. 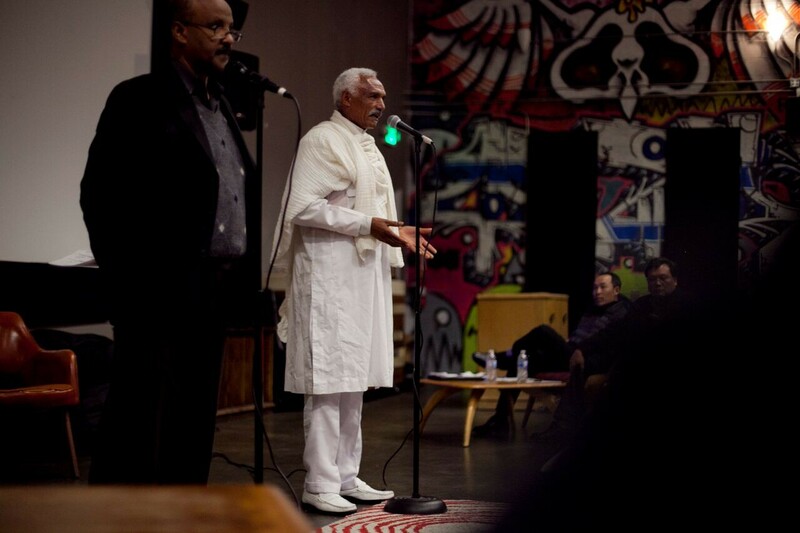 Medina joined two other storytellers at the New Parkway Theater in Oakland this past December for the inaugural Treasure Languages Storytelling event, which celebrates indigenous and immigrant languages. Medina told the story of a hyena that saved a village from a blood-thirsty monster, first in Chochenyo, (and then translated in English), allowing the musicality of the language to shine through. A second event, planned for February 21 at Awaken Cafe in Oakland, will feature storytellers presenting tales in Dafin (Burkina Faso), Shona (Zimbabwe), and Twi (Ghana), among other languages. Steven Bird, a University of Melbourne professor who is currently a visiting scholar at UC Berkeley and who co-hosted the December event, adopted the term “treasure language” from speakers of Rama in Nicaragua who were tired of hearing that their language was “threatened” or “dying.” They preferred the term “treasure” because the language is “small and precious,” he said. Bird, a computer scientist by training, began developing writing systems for ten treasure languages in West Africa in the mid-Nineties. Working with small and isolated communities in the Amazon and Papua New Guinea, he and a team of students eventually developed a mobile app to help these hard-to-reach communities record their languages before they fell out of use. The team piloted the app, called Aikuma, in 2012 in Papua New Guinea, where they also held the first storytelling event. When he arrived, fewer than 1,000 people spoke the local language, Usarufa, and of those, none were under thirty years old. The storytelling event was essential, he said, because it demonstrated to the younger generation that the elders in their community knew something they didn’t know, instilling pride in their special knowledge. There are also more insidious ways that governments use language to oppress native or indigenous cultures, Perry said. Such was the case with Chochenyo, Medina explained, when the first American settlers adopted a policy of exterminating the native residents. By the 1930s, only a handful of speakers remained. Fearing the language would be lost, John Harrington, a UC Berkeley linguist, began documenting Chochenyo speakers in Sunol. More than seventy years later, Medina relied on Harrington’s hand-written notes and voice recordings to painstakingly analyze the phonetic transcriptions in order to revive the sleeping tongue. Now, he is able to teach others and said there are about twenty people in the community who can speak with some level of fluency.